Historic HomeWorks Forum :: View topic - Weight gets stuck on separator?? Weight gets stuck on separator?? Posted: Sat Mar 14, 2015 1:08 pm Post subject: Weight gets stuck on separator?? Hi all, putting my first few windows back together! I'm having an issue in some of the windows where the weight gets stuck on the separator door between the weight pockets. Some of them I had to slde up to get to the rear(top sash) weights; others just pulled out. Hi, good to hear about your progress. You've got me stumped with "separator door." Can you explain this another way, or attach a photo or sketch? Hi John! It's just the thin sheets of lath separating the two weights. The way my windows were built, it seems like there's a groove cut into the outside of the frame to slide the lath in from the "inside" of the frame (traveling the same plane as the parting bead does when you put it in). So there's a groove on the outside, but it just floats free on the other side. 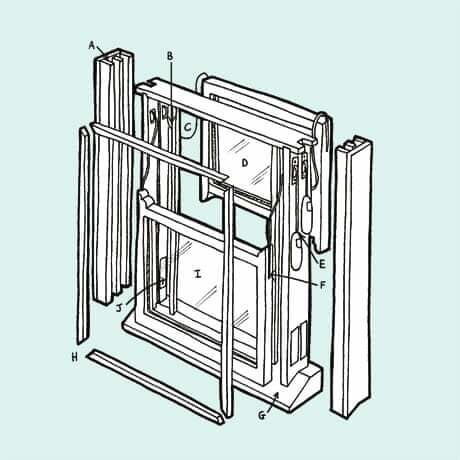 Oddly, I've seen two slightly different variations- one where the bottom lath pulls completely out, and the top lath is in the same track and then slides down- you have to hold it up to access the weight for the top sash. The other way seems to be a single longer lath- I have to slide the whole thing up to expose the upper weight. The net being, that if the windows are operated in a rapid fashion, the weight can bump the lath and push it slightly off square, since there's nothing holding it in on the free side. Then if you raise the other weight all the way up, it gets about the lath, and on the way back down can sit on top of the slightly displaced piece. Picture probably won't help too much, but I'll take the next window apart and see what I can grab (I just painted over the one I was having trouble with, for better or worse- swinging the weight around 180 degrees seemed to alleviate this issue, knock on wood). OK, now I get it. I've never seen the sash weight separator lath of wood done in this way. I've only seen a single lath of wood that does not fit in a groove, but does hang loosely from a nail in a hole near the top end of the separator. Here is a rough sketch of a separator fixed to the frame, perhaps similar to yours. Notice that both the inner and outer weight each have their own pocket door in the jamb. Is it possible that yours have another pocket door you have not noticed? Nope, definitely only one- the inner jamb on the outside side of the parting bead is one continuous piece top-to-bottom. I've painted and closed up the first four windows and just took the next 10 sashes up to Duffy for rehabilitation- I'll strip one of those windows in the next few days and take some pictures. Pic 1: Window after stripping. Note that the jamb for the inner (lower) sash has the separation for the pocket; the outer (upper) is one continuous piece of wood, top-to-bottom. Here's just the door partially open, to hopefully show the construction of the "door"
Door totally removed, exposing the weight for the lower sash, and you can see the 'separator' door in front of the upper sash weight. This one is constructed where the bottom half of the separator just pulls out, and the upper half then slides up and down. At this point I've removed the weight for the lower sash, and I'm holding up the sliding top portion of the trap door to expose the weight for the upper sash. OK, with the photos I can now see what is going on in there, and why you added tape to keep the lower separator from swinging into the outer pocket for the weight to get hung up on. For a more permanent solution than tape, you might use a tab made of sheet metal in place of the tape. --Size the sheet metal tab so it goes across the whole width of the separator, has at least one inch below the separator joint to glue and sticks up past the separator joint about half an inch. --Clean off the surface of the wood at the top of the lower separator, for good glue adhesion. --Glue the tab to the top end of the of the lower separator. 5-minute epoxy might work well. Would this work? I don't know, so think it through, since you're the one who's there and knows all the details. Please post a photo showing your final solution. Or, make the sides of metal tab wider so they fit (more or less) into the grooves that hold the separator, this would keep the tab and separator from swinging into the other pocket. Considering all these functions of the tab, I think I would make it out of steel or galvanized steel that would be stiffer than something softer aluminum or copper.